Absolutely Pristine One Bedroom Home! Almost 900SF! Live in your own Vermont like B&B! This flawless floor plan boasts a Large Open Livingroom/Dining Room with wood burning Fireplace and built in bookcase! Direct access sliders to your own private patio! Custom Designed Chef’s Eat in Kitchen boasts stainless steel appliances, quartz stone counter tops & herringbone tile back-splash with abundant cabinetry! Guest half bath. Gorgeous Antique Random Pine Floors! Towering Ceiling Height! Spacious Bedroom with its own en suite Bath! Windows & Sunshine from 3 Sides! This Home is Perfect for Living and Entertaining! It is in Mint Condition! Central Air, large Private Storage and full sized laundry complete your home buying checklist! 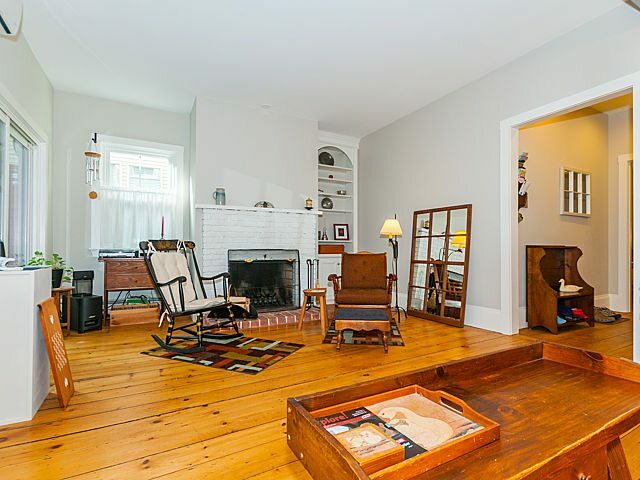 This Warm & Embracing Home is located on one of Charlestown’s loveliest tree lined streets! A True Value!